At least three major research firms believe that Windows Phone will overtake iOS by 2015, but peering that far into the mobile ecosystem’s future is damn near impossible. 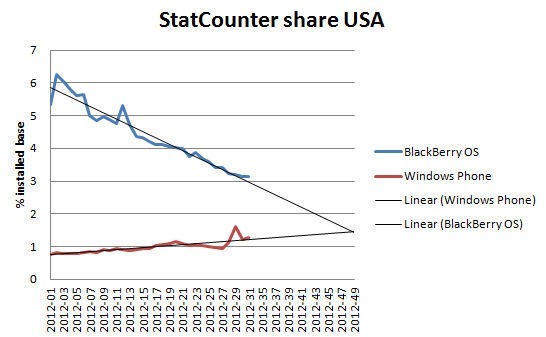 We can, however, get an idea of what will be happening in the next few months, and StatCounter predicts that Windows Phone will overtake BlackBerry very soon. According to WMPowerUser, Microsoft’s mobile platform will surpass BlackBerry in the United States by November of this year. However, that has very little to do with Windows Phone’s success, and far more to do with BlackBerry’s almost impressive failure. Both Samsung and Nokia, two major Windows Phone players, are expected to release a new round of WP-powered smartphones in the next few months, while BlackBerry 10 is said to launch before the end of the year. In either case, the U.S. market is all but officially lost to RIM, so the new WP handsets should help Microsoft surge past the beleaguered Waterloo handset maker . Whether or not Windows Phone will eventually overtake iOS is another question entirely. It doesn’t seem likely based on what we know now, but Windows 8 may propel the soon-to-be number three OS further up in the ranks.